Taste the chocolatey goodness of Mississippi Mud or marvel at the extravagant elegance of the Lady Baltimore and there will be no doubt that Southerners know how to bake a cake. Here are 65 recipes for some of the most delicious ever. 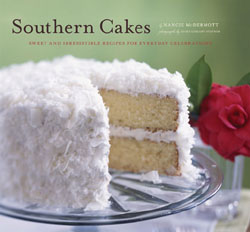 Jam cakes and jelly rolls; humble pear bread and peanut cake; whole chapters on both chocolate and coconut cakes each moist and delicious forkful represents the spirit of the South. A Baking 101 section offers the cake basics, some finishing touches (that means frosting and lots of it! ), and the how-to's of storing each lovely concoction so that the last slice tastes as fresh and delightful as the first.